"The itsy bitsy bacon, went up the baacoooon! Down came the bacon and washed the bacon out! Up came the bacon, and dried up all the..." A dramatic pause with a giggle and smile and then... "bacon! Then the itsy bitsy bacon climbed up the bacon again!" Combine all ingredients in a bowl and mix well. 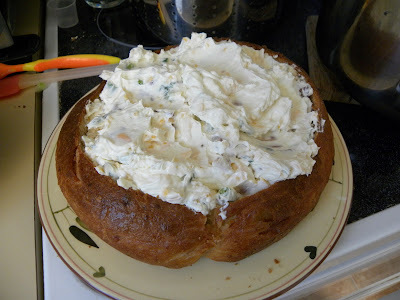 Place in oven safe dish (or bread bowl: I usually prepare a loaf's worth of dough and bake it in a pie pan to get a round loaf, and then cut out the center to make bowl for this dip!). Bake at 350 for 10 minutes. Enjoy with crackers or bread (it’s great on bagels the next day too!). Oh, that sounds GOOD. I love garlic things. Is it possible to skip the garlic salt and so more fresh garlic or does the dip actually need the extra salt to be good? Hubby doesn't like his food salty so I remove as much as I can when I make things as a general rule. Opps! I'm glad you actually mentioned that, because I meant to put garlic powder, not garlic salt. I always think of them as the same thing, but what I actually use is garlic powder, which I think is just dried garlic. The bottle I have says an 1/8 of a teaspoon is equal to 1 cover (oh wow! I use a lot of garlic!). So you could sub it in that way! But I don't think the powder should give it the salty taste! Oh.. that sounds very good. Thank you, I will have to do for this Sunday!! God Bless you!! You know, oscar mayer is making "sodium-nitrate-free" bacon now! Saw it in the store the other week, got it, tried it - can't even tell a difference! I plan on buying that from now on. This looks so good! I "pinned" it so I would remember to try it out! Also, that is great advice about making a round loaf in a pie plate! I don't know why I never thought of that before! Yum, that looks good. I'm a bacon lover too! 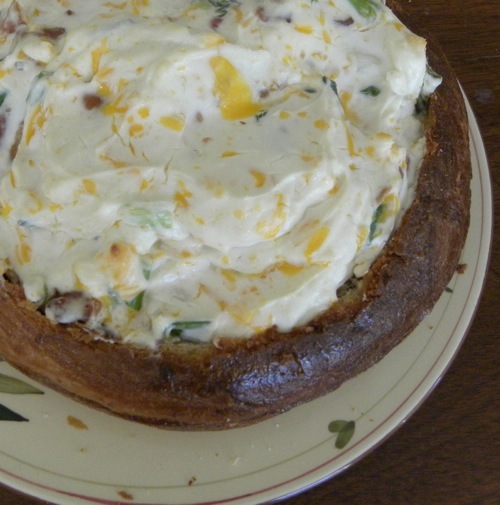 I also never thought of using a pie plate to make a bread bowl. What a great idea. Bookmarking this page!